What is Be The Light Walk? Be The Light Walk is an evening event of inspiration and hope that together, we can prevent suicide and reduce stigma. This fundraising event supports suicide prevention in Brown County, Wisconsin. The event begins with a Resource Fair followed by Survivor, author and speaker, Brandy Lidbeck. A reading of the names to remember loved ones lost to suicide will be shared. The evening concludes with a beautiful candlelight walk with Luminaries to light the path. 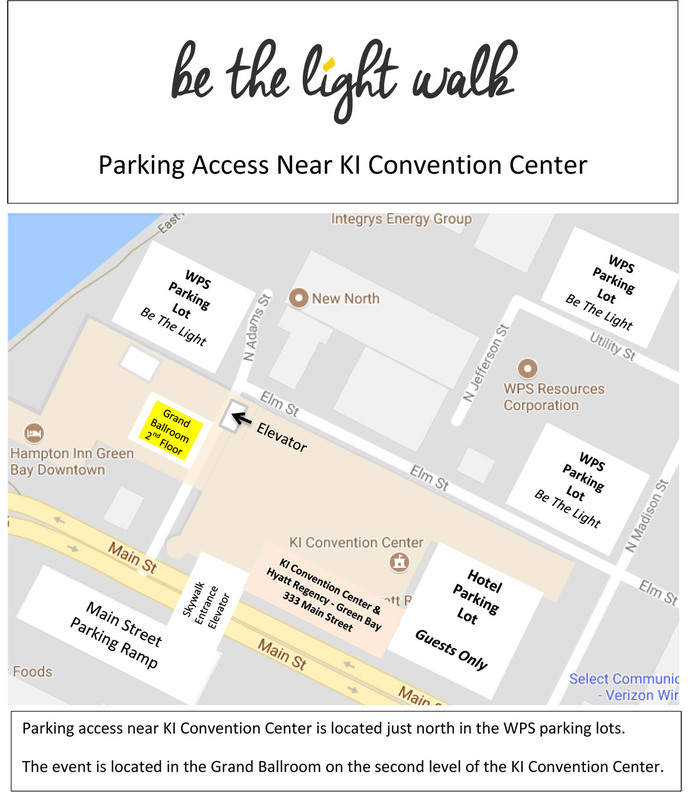 The picturesque evening walk spans 1 mile beginning at the KI Convention Center across and along the Fox River past the Brown County Museum, back across the Fox River and finishing at the City Deck in Green Bay. This event is for survivors of suicide loss, community leaders, concerned citizens, and advocates in the fight against suicide and suicide stigma that creates barriers to treatment in our communities. Who/What is Brown County Coalition for Suicide Prevention? Brown County Coalition for Suicide Prevention is a collaborative effort of over 30 agencies & community organizations, including medical examiners, schools, healthcare professionals, nonprofit organizations, and public health officials, whose aim is to inform and educate the public about warning signs of suicide and leading community-focused initiatives that help save lives. Every walker who registers online receives a new 2018 #bethelight Shirt, wristband & candle. Limited sizes and styles will be available for walk-up registration, but we cannot guarantee sizes or quantities. Walk-on registration purchase shirts separately. NEW! This year, we’ve added a free child registration option for kids 12 & under with the hope that more families can join us for the walk. This option does not include a shirt. Each child will receive a BTLW-themed wristband and candle to walk with. No. But… It’s smarter, easier & cheaper in advance. Short wait time on the day of the event. Walk-on registration is $20. I missed Team Registration. Can I add a team or member to my team? Unfortunately, due to our production timeline for shirts, we had to close this specific registration early. But you are welcome to get a group to walk together. Individuals may register online or at the door and walk with your group. I’m a Captain. How do I see my team roster? We had it up a couple days after team registration ended. Once online registration closed, part of the closing was the access for Captains to see their roster. Use the contact form below and we’ll try to get to every request. We’ve got 72 teams and a volunteer staff making preparations in the 11th hour. Be patient. This is a family-friendly event, open to all ages. We recommend that a parent or guardian accompany any child under 13 years old. Please have some type of ID at the registration table to verify your order or if you plan on paying with anything but cash. Free ramp parking is available. See map for specific lots to use and which to avoid. Food establishments are within walking distance of the KI Convention Center and CityDeck. Where do I go if I registered online? KI CONVENTION CENTER GRAND BALLROOM UPSTAIRS. We will have a designated pre-registration area for you to pick up your bag of items, so it will be a breeze getting in. Each person, INDIVIDUAL or TEAM will pick up their own bag at PRE-REGISTRATION. I’m bringing people who didn’t register online. Can we register there? YES! We will have a registration booth. Please make checks payable to Bellin Health Foundation, memo: BCSPPF. Most major credit cards and cash are also accepted. If you registered online, you will get a 2018 Edition Shirt in the size you requested in your registration bag. It will be in your bag that you pick up when you arrive. Limited sizes and styles will be available for walk-up registration, but we cannot guarantee sizes or quantities. BTLW Event Shirts are $10 for walk-on registrations sold at the Merch Table. What if I can’t make it to the event now? No, you can’t pick stuff up early. Contact us after the event and we’ll do our best to get you a shirt. If you registered with a team, we will have it unless you request someone pick it up in your absence. Please provide them with your confirmation so we know it’s legit. Please note if you registered as an INDIVIDUAL, we will do what we can to keep your shirt size. Understand it’s very possible that we may not come through the event with your size based on the amount of walkers and shirt availability. NOT ALLOWED – Alcohol, illegal drugs, firearms, weapons, or any item that resembles a weapon or firearm (including personal paint ball guns) or fireworks. Items will be confiscated and will not be returned. Violators may be removed from the grounds without a refund. Any illegal activity will be reported to the proper authorities. RECORDING EQUIPMENT – Unauthorized video cameras, tape recorders and professional camera equipment are strictly prohibited during Brandy’s Keynote Talk. Laser pointers are also prohibited at all times and locations during the event. ANIMALS – You can’t bring your pet to Be The Light Walk, however registered service animals/guide dogs are allowed with proper documentation. GOLF CARTS / SCOOTERS / ATVs– Wagons & Walking Strollers are acceptable. Motorized scooters (except those needed for medical assistance) are not allowed in KI Convention Center or along the Walk route. ATVs are strictly prohibited on the grounds. Be the Light Walk reserves the right to eject anyone from the venue or Walk route without refund for anyone using any of these. Be the Light Walk reserves the right to refuse admittance or eject anyone from the venue or Walk route without refund for anyone found in violation of the above policies. Your belongings are your responsibility. We cannot be liable for any loss, damage or theft of your property. Thank you for understanding! The BTLW Team will monitor the weather throughout the days prior to the Walk. Should severe weather arise, the Walk can be held indoors. Come rain or shine! Watch our Facebook & Twitter pages, too! No refunds, but you can transfer registration. Please contact us with updated information on registration or any questions. This is not exhaustive. Please send us your questions and we’ll add more to this page.